Masahiro Kobayashi, who’s developed a cultish following – largely outside Japan, is probably best known in his early films for his French New Wave homages and in his later films for his repetitive and austere style applied to deep social critiques of contemporary Japan. This austere toward boring style is mostly what has divided fans and critics. I fall into the realm of fandom. What’s often overlooked in the big picture of Kobayashi’s oeuvre is his delicate and sensitive work with a who’s who of Japanese actors. Akira Emoto, hot off “Dr. Akagi,” camped it up in “Kaizobukan Bootleg Film” (1999). The film that marks the beginning of the Kobayashi style, 2001’s “Man Walking on Snow,” was a vehicle for Ken Ogata. Teriyuki Kagawa appears in many of his films. Ryo Ishibashi took the starring role in “Shiawase” (2006). And Makiko Watanabe was brilliant carrying a largely silent role in “The Rebirth” against Kobayshi-san himself, no slouch of an actor himself. When the doors of a ramshackle seaside cabin burst open and the angry Tadao limps out, bellowing, casting off his cane, followed by his distraught granddaughter, Haru, one knows one’s on for a ride of actorly chops and a new challenge for Tatsuya Nakadai. As Tadao, the old washed-up failure of a herring fisherman, Nakadai brings a not only an honor and grandeur to this role (remember, this is Nakadai!) but exposes his many flaws and problems, often only through gestures and glances. Eri Tokugawa as Haru, lumbering with the same bowlegged walk as Nakadai and wearing particularly frumpy clothes goes against her usual model cuteness, She naturally plays off the almost infantile emotionality of her grandfather accepting reluctantly the adultness thrust upon her. “Haru’s Journey” is a road movie, taking our two heroes south from Hokkaido in search of a home for Tadao and work for Haru. This simple premise reveals a hard look into family dynamics and the unraveling social contract in contemporary Japan with a very forgiving viewpoint. Tadao, nearing the end of his rope – and his life – hits the road with his granddaughter, Haru. First he goes to his well-off older brother, Shigeo (Hideji Otaki) and his wife, Keiko (Kin Sugai). Pride and old family hurts keep Tadao from accepting an old storage room in which to spend his final days. Plus, Keiko reveals that she and her husband are moving to a retirement home anyway. He then searches for his brother, Yukio, last whereabouts, prison, current whereabouts unknown. They meet his partner, Aiko (Yuko Tanaka) a simple, hard-working woman, who can offer little but a good ear. Next they move on to his older sister, Shigeko (Chikage Awashima), ryokan owner and self-made woman. She’s happy to have Haru work for her, but Tadao, becoming kidlike in his older sister’s presence brings out his last vestige of male pride and moves on. Finding his remaining younger brother, Michio (Akira Emoto) brings the deep-seated family tensions to a head, resulting in argument and a fight. But even this loutish brother has a bit of heart, paying for a hotel for the travelers even though he’s really in debt up to his ears. The final chapter leads Haru and Tadao to a sylvan island where Haru’s estranged father, Shinichi (Teruyuki Kagawa) lives with his new wife Nobuko (Naho Toda), raising horses. Shinichi had left Haru and her mother (Tadao’s daughter) years before because of an affair Haru’s mother had. Unforgiven, the woman committed suicide, leaving Haru in her grandfather’s care. The final confrontation and reconciliation between Haru and her father brings some emotional closure, but certainly doesn’t bring them together. Noboku invites the old man to live with them, but Haru and Tadao run off together, realizing that in this hard world, they are the best lifelines for each other. The emotional tenor of “Haru’s Journey” revels in the subtle changes and revelations of each character’s background, relationships and arc in the dynamics of this “typical” family. The main reference is Ozu’s "Tokyo Story." Even the casting of Chikage Awashima, who worked with Ozu, creates an historical link. Kobayashi himself has pointedly said that “Haru’s Journey” is his own "Tokyo Story." Mostly eschewing his own austere visual style – though there are some visual repetitions – Kobayashi in “Haru’s Journey” shoots much in close-up and with shallow-focus, forefronting performance and actorly nuance over the visual and emotional spaces he generally highlights in his films. If there is one Kobayishi-ism that remains in Haru, it’s his character’s voraciousness in consuming food. In most of his films, his characters eat, often alone and more often with an almost insane lack of fulfillment – stuffing their faces with endless amounts of convenience store or cafeteria food. In Haru, there’s plenty of eating, but this time with grandfather and granddaughter sharing in not only the physical, but the emotional pleasures of breaking bread – or rather noodles – together. The one exception that harkens back to early Kobayashi is a strange and touching scene early on where Tadao chugs a couple of one-cups, only to pass out. Though “Haru’s Journey” may on the surface seem a more conservative exploration of Japanese society than the likes of “Bashing” or “The Rebirth,” the stunning performances of all involved – especially Nakadai – shows Kobayashi digging deeper into emotional truths. 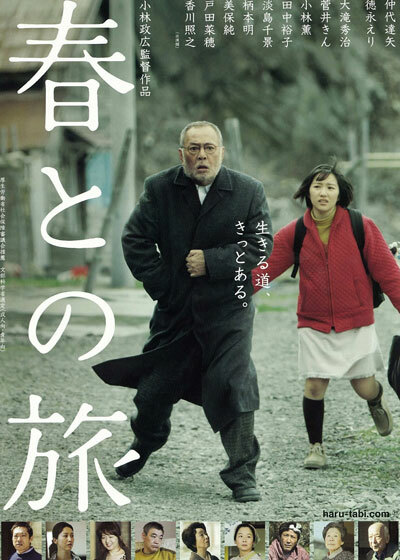 Nakadai as Tadao, - old, but still restless under the skin, twitching with tics - creates a decidedly old-fashioned everyman, resonating with tragedy and backhanded hope. Part of Kobayishi’s genius here is in allowing Nakadai to take the character of Tadao into uncharted territory, creating yet another career defining performance.